I just came across a great deal on some affordable fonts...I personally wouldn't want to spend upwards of $60 per font from other sites, so this is a welcome source for (can I say cheap?) fonts. 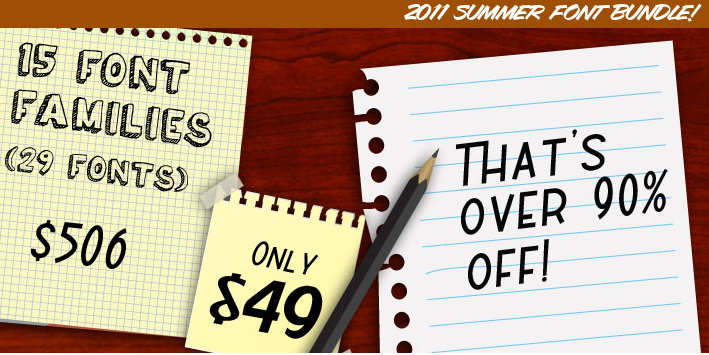 FontDeals is a site similar to Groupon, Heartsy and others, where you can purchase a "deal". FontDeals is actually run by one person and offers up fonts of his design, and I'm sure he's hoping other font designers will jump on board with him. So right now, for $49 you can receive $506 worth of fonts! How amazing is that? Time is running out on this deal so you might want to grab it today. I LOVE fonts! I usually use dafont, so I'll have to try out some of these you've mentioned!